Good: Gorgeous remake of a cult-classic. Bad: Interface needs some work in order to create a completely smooth experience. Larry is back and it’s not another one of his three-dimensional mishaps either. 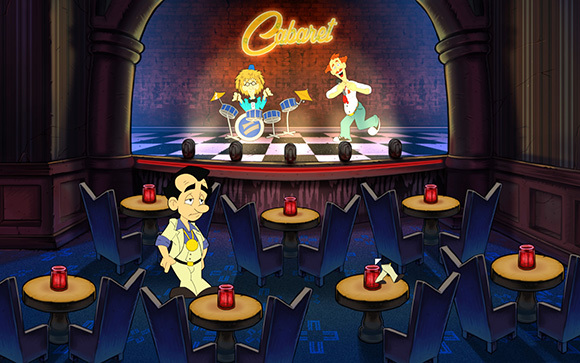 Instead fans got what they’ve been asking for years; a complete remake of Leisure Suit Larry in the Land of the Lounge Lizards. Truth to be told, I’ve got a personal history with this game. At the age of ten, it was the very first videogame I discovered on an old black ‘n white Apple computer my dad got from a friend. Yes, Larry’s adventures have never been anything close to suitable for a younger audience, but I’ll be damned if I actually understood most of what was going on. That’s why my dad -amused as he was at my unknowing attempts to get a virtual 40-year-old virgin laid- got me a walkthrough. That’s about 50 pages printed out people, the internet back then didn’t allow loading a site like Gamefaqs yet, let alone open a simple text-only page without also offering the time to clean the entire house. Clearly Land of the Lounge Lizards fills me with nostalgia. Time to have a first look at how those feelings hold up to the reality of the game’s modern remake. You play as Larry Laffer, a 40-year-old failure who’s most recent attempts to finally score with a woman -any woman- has driven him to Lost Wages, a town loosely based on the seedier parts of Las Vegas. Larry’s still down on his luck though, he’s basically out of money and has con men and women eyeing what little possessions he has left. That is, if they’re not being beaten out of him by local thugs. By now, you’ve more than likely seen some of the screenshots in this preview, so you’ll already have a clear view of how much things have changed. 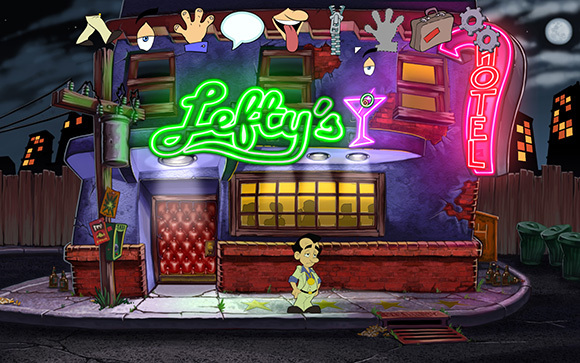 This remake isn’t just bells and whistles though Aside from entirely new graphics, Leisure Suit Larry: Reloaded also offers a fully orchestrated soundtrack to replace the chiptunes from the original game. Other than that, the chat commands that used to demand you manually had to type every action Larry had to take have now been replaced by modern point & click values. Scrolling up or down switches between actions like Look, Talk, Take, Walk and Lick/Sniff -this is still a Larry-game after all. 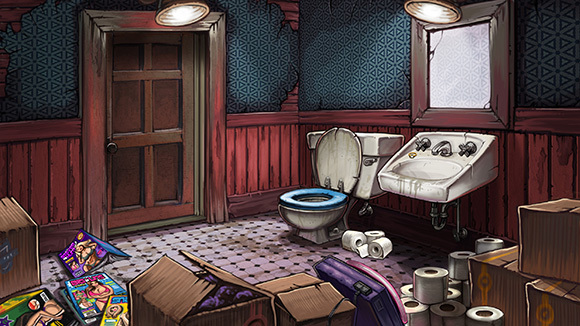 There’re lots of items to collect, all of them are necessary to help Larry successfully ditch his pants. I’ll write a detailed report on all the changes once I get my hands on a review-copy. No sense in spoiling everything right now. At the moment it’s enough to know that a cult-favorite has received a major update to justify a re-release. In all honestly, I’m not expecting many changes between the version I got to play and the complete retail-approved version of the game. If there were to be changes, though, I’d wish for some smoother menus. At the moment switching between items and even simple actions like saving feel convoluted and cumbersome. Most of the time it were rather small details that irked me, like not being able to quicksave or an inventory preventing me from exiting -and this also goes form some area’s in the game- by clicking outside of it boundaries. I mean, things like that are considered standard practices in modern point & click games. An enormous amount of work must have gone into recreating one of Larry Laffer’s original and most celebrated adventures. Crisp and detailed art and compelling, layered tunes convincingly bring the tow of Lost Wages to life. Now if only the same amount of attention could be used to fix the menus, we would all get the classic videogame we all wanted. Nairi: Tower of Shirin – Release date announced!